I grew up thinking that everybody gardened and that all children were given small plots of land at home on which to grow their own marigolds, swedes and radishes. Gardening was high up on the list of our family’s pastimes. 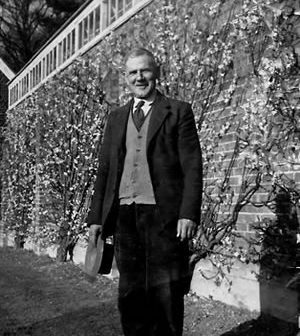 My father did a lot of gardening at home (as did his father), my mother’s father was a professional gardener and his father was Head Gardener at the Tilgate Estate in Crawley. It was probably fairly inevitable that I would catch the gardening bug through association. 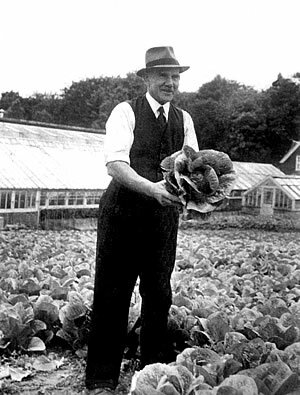 Gardening has literally put food on the table and paid the bills of my ancestors, it even paid for my great grandfather (George Cook) to see out his days in a care home. The charity that paid for this care was known as the Gardener’s Royal Benevolent Society and today it is known as ‘Perennial’. 180 years old this year, Perennial is a very worthwhile horticultural charity supporting people who work in horticulture as well as their families (with advice, support and financial grants where needed). Over the past few years, as I have become more aware of how much my great grandfather benefited from its existence, I’ve done a few little things to help raise awareness of Perennial’s good work. Through my tweeting as @montysdognigel I actively retweeted Perennial’s own social media posts (to drive up awareness) and in each of the past two years I think I raised a few hundred pounds from twitter followers by asking them to donate and show appreciation for my time spent on the @montysdognigel account. On Tuesday night (29th Jan) I am off to the annual ‘Party for Perennial’ again, a fund-raising event of fizzy refreshments and prizes. I look forward to sharing a drink with fellow gardening writers and allotment bloggers whilst toasting Perennial and old George! 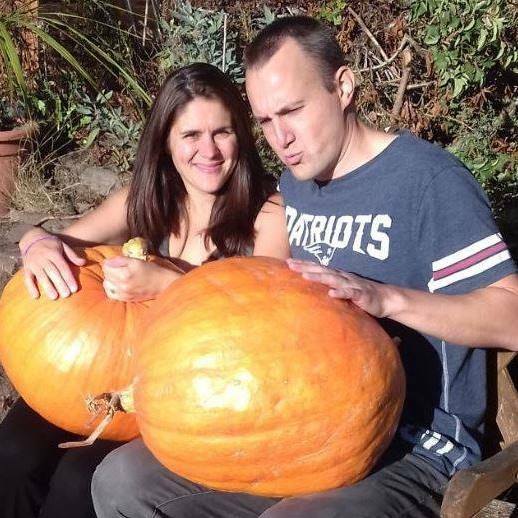 Here’s a short biog about him complete with radio interview and his tips for growing peaches! Born in Tilgate, Crawley, to the son of a gamekeeper, George Cook left school at the age of 12 to become a brick layer with a weekly pay of five shillings (60 pence). In 1906, aged 17, he turned to gardening on the Tilgate estate which saw his wages increased to nine shillings a week. By 1916 he was a married gardener with children and drafted into the Great War. After his time spent fighting at the Somme and Passchendaele, George returned to the Tilgate Estate to take up his position as a gardener again. Working in the kitchen garden with six other gardeners, George reported to a Head Gardener by the name of Mr Neal. The gardens at Tilgate specialised in growing fruit such as grapes, peaches, figs, apples, melons, raspberries and gooseberries but also grew vegetables. 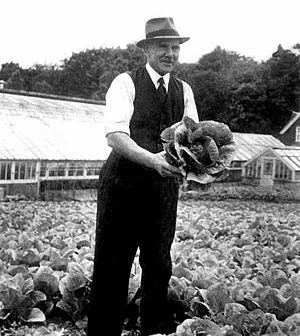 Produce was exhibited several times a year and in 1922 the team won the RHS Gordon-Lennox Trophy (for vegetables)… more recently won by Medwyn’s of Anglesey. 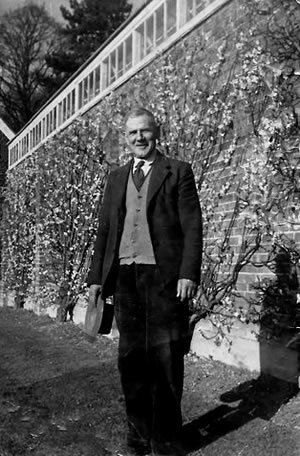 In 1939 at the start of the Second World War (and aged 50) George became Head Gardener at Tilgate and moved into the house on the walled garden. During this time the entire Tilgate Estate was sold off by the Nix family and the walled garden became owned by FW Berk & Co (Fullers Earth) Ltd, Horsham, as a horticultural research centre. George loved his time spent working with FW Berk where he trialled the growing of tea, peanuts, cotton and bananas. He often told of his wonderful FW Berk lunches at the Savoy (which particularly tickles me after the past two years of Garden Media Guild lunches I’ve enjoyed at the Savoy). 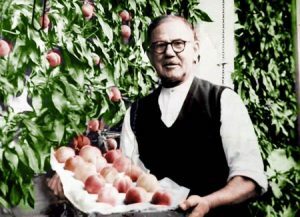 As a horticulturist George became very well known for his peaches which were grown to weigh exactly 12 ounces. 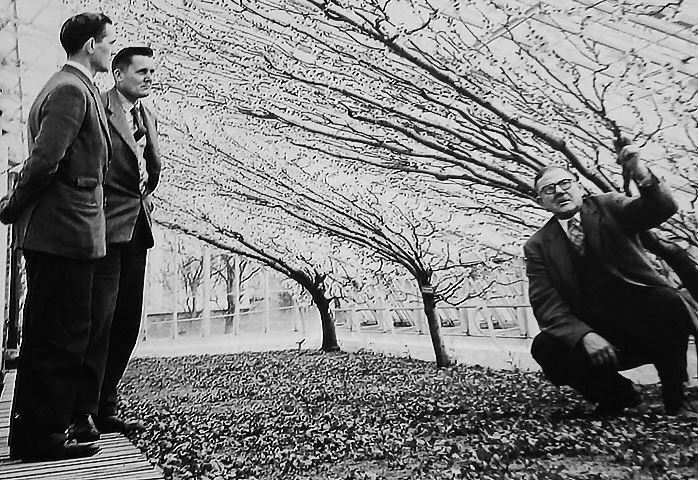 In the springtime the greenhouses were filled with peaches and nectarine trees, each intricately pruned so that it spread over the roof and walls. George kept bees and used them to pollinate his fruit trees. George Cook (right) sons Jack and Ted (left). Produce was sold via a company called George Monro & Sons at their Fruit, Flower and Vegetable wholesaling premises in Covent Garden. After the Second World War, Tilgate became a tree supplier to Crawley Council during the development of the new town. George spent a lot of his time looking after the trees before retiring after 60 years of horticultural service. In 1987, when he turned 97, George went to live at Red Oaks – the Gardener’s Royal Benevolent Society Country home in Henfield, Sussex, where he was very happy and celebrated his 100th birthday, a year in which he also met the Queen Mother. Eventually George moved to another care home in Westcott, Dorking where he passed away in 1997 aged 108 and England’s Oldest Man. Oddly Westcott is also the village that MrsGrow is from and where I myself have lived these past 11 years, purely coincidental – George didn’t introduce us, though whether he managed to influence the outcome and my Chairmanship of Dorking Allotment Holder’s Association from beyond the grave I don’t know! Previous ArticleBone meal, a gruesome fairy-tale fertiliser? Next Article Lunar Gardening – Should We Pay More Attention to the Moon?